Speaking as someone who almost exclusively plays video games on consoles, this writer was naturally skeptical to find out that the purported ‘best’ version of the newly released Devil May Cry, created by Ninja Theory for the Xbox 360 and Playstation 3, is actually the PC version. It just didn’t make sense. 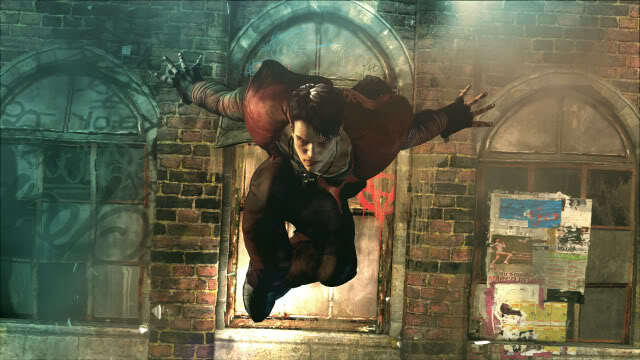 DMC is a hack and slash platformer bursting at the seams with personality and insanity. Perhaps more mellow than the original version, but served far better by a more compelling plot and characterization, it just seemed as though this type of game would be best served by a game controller, not played via keyboard and mouse shenanigans. Luckily for PC enthusiasts, this old hand was wrong. According to early impressions of the PC version, which is slated to release in just a handful of days on January 25th, this game beats out the consoles for a couple of compelling reasons. First off, the visual acuity of a PC allows the game to run at a frame rate of near 60 frames per second, with nearly no lag. For such an action packed game, the faster it moves, the better. A second reason that this version is worth the wait is simple – on PCs this beauty looks like a next gen title, and the feel of the game can be improved by the use of various simple peripherals. So with better looks, and adjustable brains, it looks as though Dante is best enjoyed on your computer screen.